There’s a 2 in 3 chance that a house in King County now costs more than half a million dollars. Home prices climbed more than 10 percent in every county within the Puget Sound region last month, led by especially big gains in the city of Seattle. The median price of a single-family home in Seattle grew 17.6 percent from a year prior, the biggest increase in 19 months, according to monthly home sales data, released Monday. The typical Seattle house sold for $735,000, or $110,000 more than at this point last year. Prices have nearly doubled from when the market bottomed out six years ago, and are up 55 percent from the previous bubble peak a decade ago. Read more stories on real estate here. 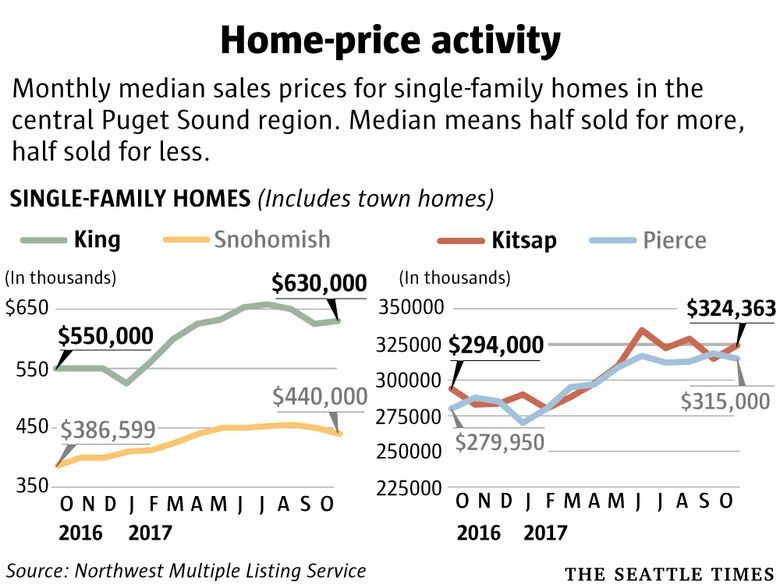 Home prices were up 27 percent from a year ago in Sodo/Beacon Hill, 21 percent in southeast Seattle and 20 percent in the area stretching from Ballard to Greenwood. The suburbs were only slightly less hot, with big jumps in prices from the Eastside to Tacoma to Snohomish. West Bellevue hit a record price of $2.6 million for the median house, up 30 percent in just a year. It’s more of the same for a market that has been surging for a long time. Overall, two-thirds of homes across King County have sold for more than half a million dollars so far this year, according to the Northwest Multiple Listing Service. Two years ago, less than half of homes topped $500,000. Across the metro area, prices here have been rising faster than anywhere else in the country for a full year. The shortage of homes for sale continues, though inventory looks a little better this month. The number of new listings in King County jumped at the highest rate in more than a year. Still, they were getting snatched up quickly: The total number of homes on the market fell 13.4 percent from a year ago, though that was still an improvement from the bigger year-over-year drops the region has become accustomed to. Looking across the county, the median house sold for $630,000 in October, up 14.6 percent from a year prior. The only region that saw prices drop was the small Skyway area. While West Bellevue was on fire last month, the Eastside as a whole cooled a bit, with prices across the region up 10 percent — which was actually the slowest in two years. 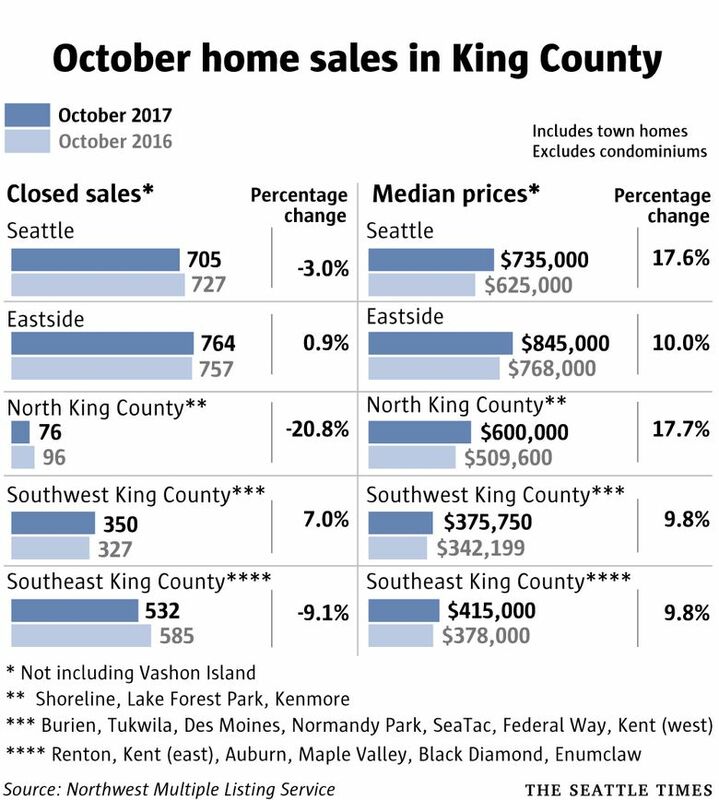 The north part of King County, including Shoreline and Kenmore, has been the hottest local market all year, and that continued. Buyers looking for something cheaper — a condo, or a house farther out — aren’t faring much better. 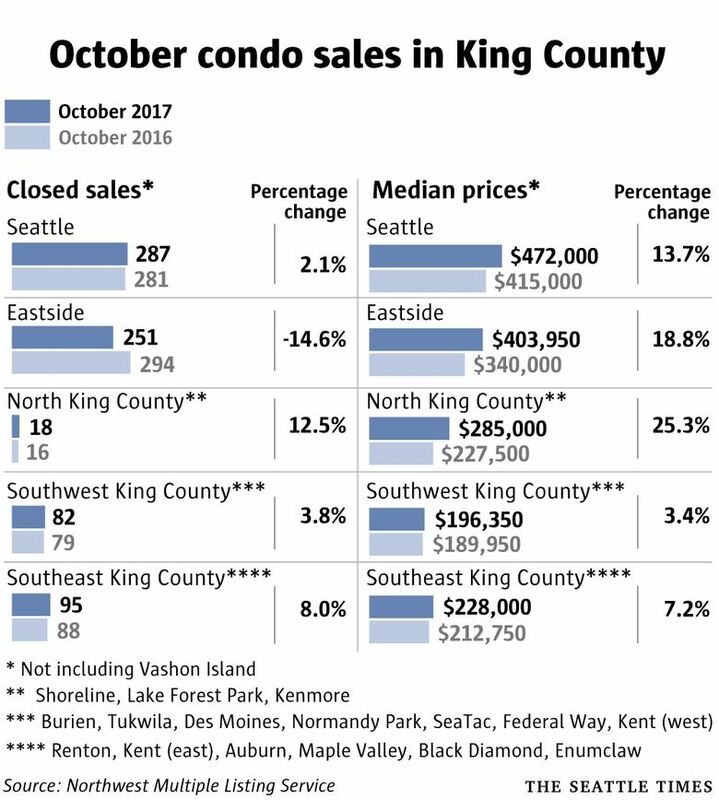 King County condo prices grew 18.1 percent from a year ago, with the typical condo selling for $378,000. Snohomish County’s median single-family home cost $440,000, an increase of 13.8 percent in a year. Pierce County homes grew 12.5 percent to $315,000, and Kitsap County increased 10.3 percent to $324,000. In all four local counties, prices remain down a bit from their records reached in the spring and summer, which is a normal seasonal pattern. We’re heading toward the slowest time of year for the market, as the dark and dreary days keep people from going out to tour homes. Last year, prices didn’t budge from October through the end of the year. For homebuyers looking for a somewhat less-depressing spin, there’s this: October’s home-price increase was a bit slower than in some prior Octobers. That snaps a three-month streak in which King County had its hottest-ever September, hottest-ever August and hottest-ever July.